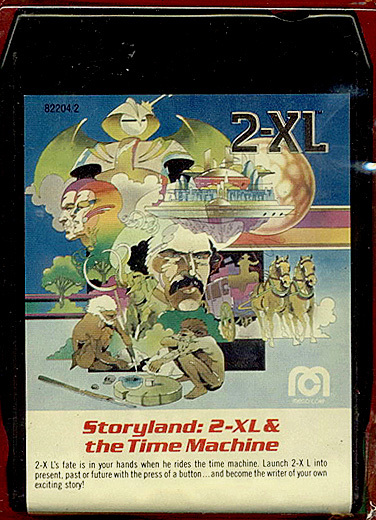 World of 2-XL: Mego 2-XL Program "Storyland: 2-XL & the Time Machine"
Printable Page 1 Front contains back cover, front cover, pages 2 & 13. 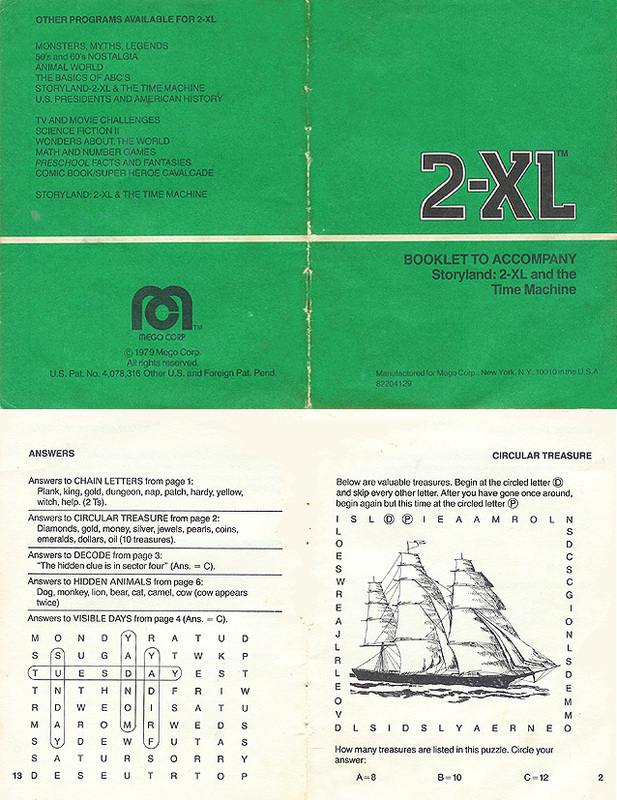 Other Comments: This one is probably my most favorite 2-XL program ever. "In the latter quarter of the 20th century, the same technology that created me made possible the invention of a time machine." And with those words, 2-XL begins our story as he travels through time. One has to wonder what a time machine manufactured by Mego in 1978 would look like! 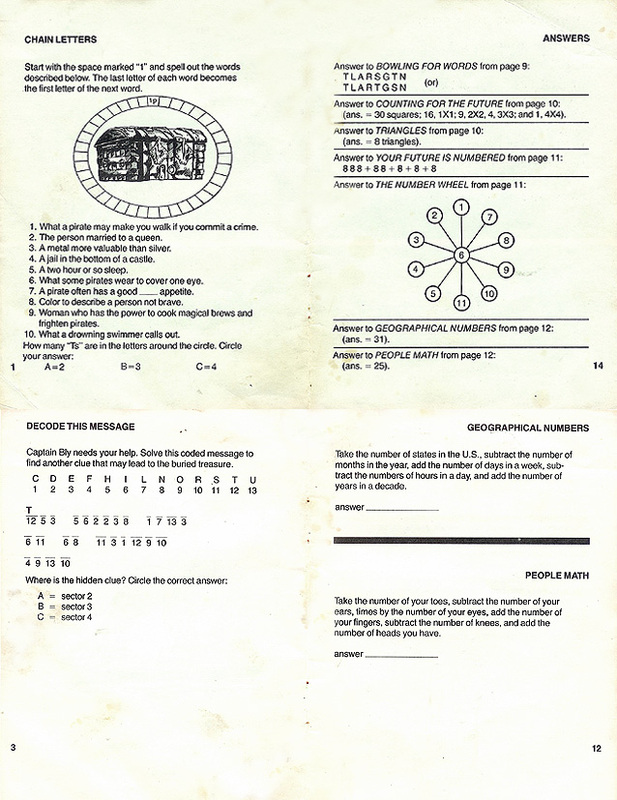 The tape is broken up into two programs: Program 1 contains the bulk of the story, and is more directly interactive as you use the A, B and C buttons for it. You get to chose 2-XL's first destination (a short trip to either the past or the future) but from there on 2-XL's in control and you're helping him out for the next two trips: one to 1725 to meet Captain Bly on Treasure Island, and then on to 8000 BC to meet Caveman Da and the Advancites. 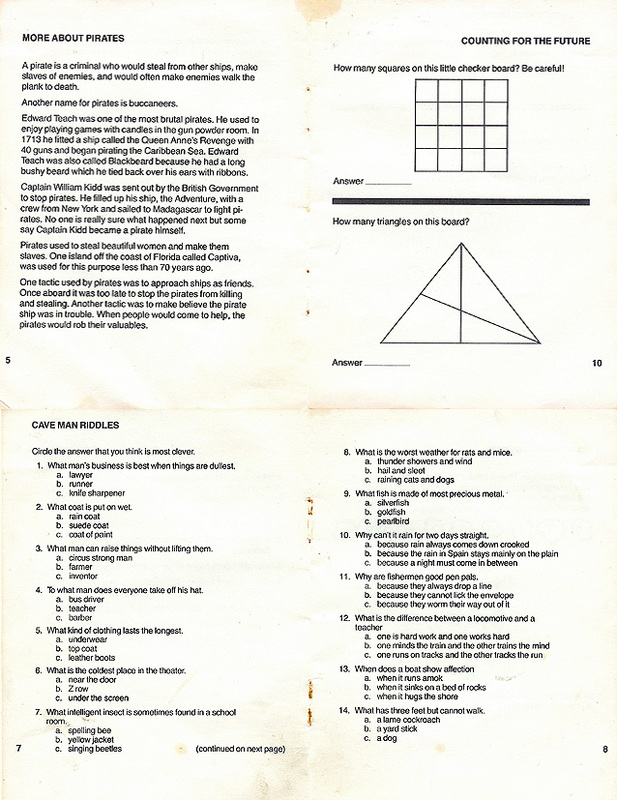 Dr. Freeman attempts something very challenging here: you and 2-XL have to help Captain Bly find his buried treasure by answering puzzle clues and questions correctly, and any wrong answer will keep you from finding the treasure. The trick, though, is getting this to work succesfully on an 8-track! More than just a simple "right answer thread" and "wrong answer thread," this sequence uses three completely different threads, so any mistake can really spin you around. 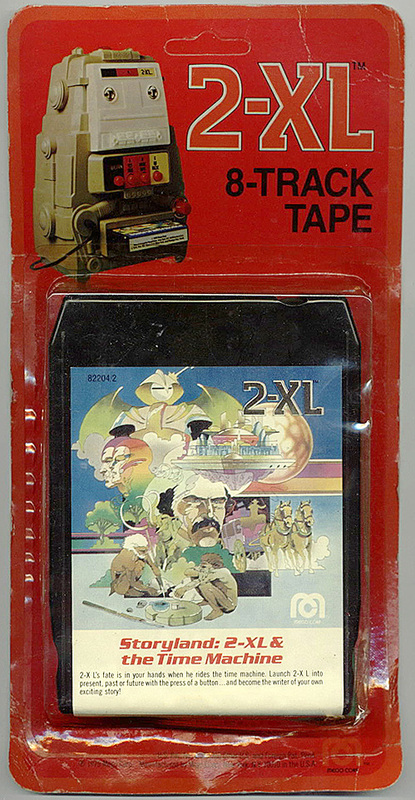 Of course, 8-tracks being what they are, it is possible to be wrong and still have a 33% chance of stumbling back onto the right path, but 2-XL tries to slant the questions so that won't happen. All in all it's a great experiment and makes for a lot of variety on repeat plays. Program 2 finishes the story by taking you into the future to the year 3000 AD, and then back to the present for some more fun and games with the little booklet, as well as some sound games involving time, time trivia, and the usual batch of bad jokes. Although this program is completely on the Question button track, meaning there's no button pushing going on at all, the little booklet and counting games still keep it interactive. And of course, this also means a plethora of great KPM Library music! 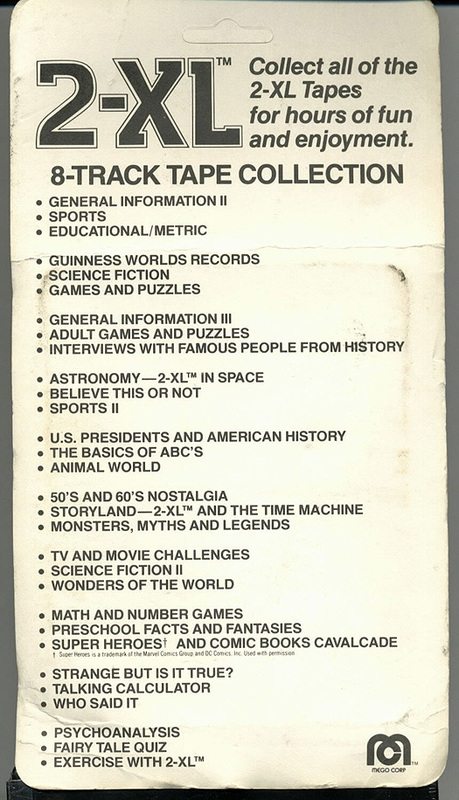 And speaking of KPM music, although many of the tapes made around this time use the "2-XL & the Time Machine" and "Space King" songs, this is the only tape that seems to have them complete. It sounds like Dr. Freeman pulls triple duty in this story, as the voices of 2-XL, the 1945 radio newscaster, and Caveman Da. The little booklet is absolutely essential for this one. 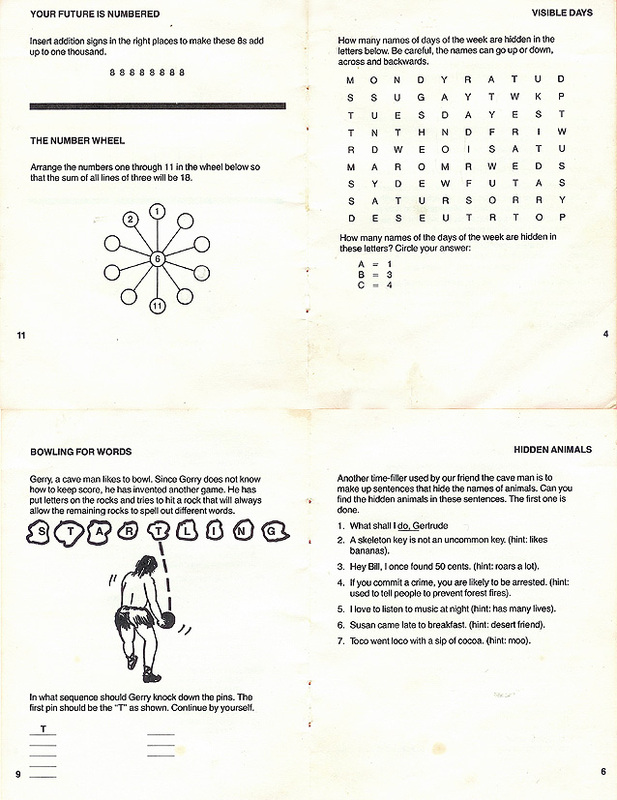 In addition to needing it for the treasure hunt with Captain Bly, Caveman Da and 2-XL have you do 14 questions of Caveman Riddles, which are only found in the booklet. When 2-XL goes over it with you, he'll either ask just the question without the choices, or give you just the choices without the question. For most of them he gives you neither and just asks "Let's do the next one, push A, B or C, now!" So without the booklet you will be missing a big part of the story. And speaking of the story... I was hesitant about getting into the details of the story for those who may not have heard it yet, but I can't resist. If you don't want to know the details and quirks of the story, you may want to stop here. LET THE SPOILERS FLY!!! In 1725, if you don't find Captain Bly's treasure, 2-XL runs away in the Time Machine while Bly is left to search for him and say "Ooh, that 2-XL, if I could find him I'd squeeze him and bounce him and..." Well, he won't have long to wait to find him. When 2-XL meets Captain Bly, it starts raining, so 2-XL takes himself and Bly back in time one day to avoid the rain. This also means that 2-XL's now created a time loop! If you help Bly find the treasure, then no problem, we can assume Bly has left by the time he and 2-XL both "arrive" again the next day. But if Bly hasn't found the treasure, then 2-XL will arrive again in 24 hours, and the whole thing will happen all over again. Presumably, that would simply be the next time you played the tape. However, Bly's now angry at 2-XL, so shouldn't he be ready to carry out his threats as soon as he sees him? Of course, the first thing he does when meets 2-XL is try to take him prisoner, so maybe he's just keeping quiet about having met 2-XL in the previous timeline so as to increase his chances of 2-XL helping him find the treasure. Who says time travel causes headaches? So just what year is the "present" for this tape? It was made in 1978. However, if your first choice for 2-XL is to send him into the past, the first year he passes as he departs is 1980! And when he returns to the present, he says "1983, 1982, 1981... stopping... now." This implies this story can only be started in 1980 or 1981. And speaking of the 80s, when 2-XL goes to the year 3000, he tells the children of the future that the words "clockwise" and "counter-clockwise" became meaningless, because every clock in the world went digital shortly after 1983. Even as a kid I wondered, how on earth would he know this? It's not like he's had a chance to visit 1983 since the story began... and besides, that idea is wrong on so many levels! Every clock in the world? Even Big Ben went digital? And his argument that no one would ever again use the words clockwise and counter-clockwise doesn't really work either, because the words wouldn't just drop out of usage... more likely people would be saying "Why do we call it that, anyway?" A fun story, some great puzzles, and some great music. They just don't get any better than this! * A NOTE ABOUT PRINTING THE BOOKLET: Print out Page 1 Front, then turn Page 1 over and put it back in your printer and print Page 1 Back. Repeat this for all the page numbers. You should now be able to cut the pages out and lay them inside each other, recreating the booklet. SMALL VERSION pages contain 4 booklet pages per printing page, so it saves on ink and paper, but they're harder to read. (STANDARD VERSIONS and LARGE VERSIONS are coming, along with an option for you to vote for which format you like best and would like to see all future booklets done in.) All my tests have shown these to work on the most computers and browsers, but if it doesn't print correctly for you, your best bet is to save the file and open it through an image program such as Adobe Photoshop and resize it there. I recommend printing it in the "normal" or "best" settings to make it the most readable. Hope these help!